Lightning is a 8 pin connector produced by Apple Since 2012. It replaces the 30 pin connector with the third generation iPod introduced in 2003 on all new products. allowing to display the application interface music on a compatible car audio system, as well as the outputs analog video (composite and component). theiPod Shuffle is the only product on the catalogue that is not compatible. It might not be available until end of 2017 Apple at risk of having to comply with the European directive that imposes a solution open and standardized in 2017.
for the benefit of the USB Type-C port. Lightning was introduced by Apple September 12, 2012, at the \keynote\ announcing theiPhone 5, theiPod Nano 7th generation and theiPod 5th generation touch. It replaces the old connector 30 pins. The first docking station equipped with the Lightning connector (OnBeat Micro) has been designed by JBL and launched end of 2012. 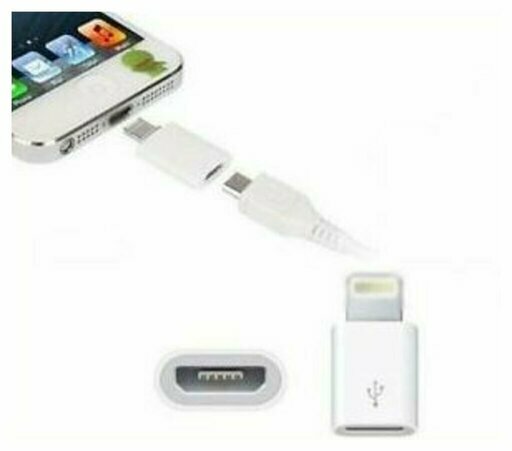 Since the availability of iOS 7, many counterfeit Lightning cables have difficulties to work properly and the phone or tablet display a message of inconsistency. The Lightning connector received a mixed reception due to its incompatibility with the very many devices of iPhone and iPod precedents, without so far rest on an open such as the micro-USB format standard. Apple remains in compliance with European standards by offering a Lightning adapter to micro-USB, allowing however that recharging, the data cannot be conveyed by the Lightning in direct connection cable (as well as Wi - Fi). The two tracks (L0/1n and L0/1 p) can be reversed depending on whether you are on a device or a computer. The tracks are not reversed if an identification chip is connected to the way ID0. Adapter Lightning to Jack 3.5 mm. Lightning is integrated to some Apple products and third-party accessories dedicated to them. iPhone : iPhone 5, 5s, 5 c, 6 and 6 Plus, 6s and 6 s Plus, SE, 7 and 7 more, 8 and 8 more, X.
iPod : iPod touch 5th and 6th generation, iPod Nano 7th generation. iPad : iPad 4th, iPad 5th, iPad 6th, iPad Air, iPad Air 2, iPad Mini, iPad Mini 2. iPad Mini 3. iPad Mini 4 and iPad Pro (9.7 \, 10.5\ and and 12,9 \). Accessories : Magic Mouse, Magic Keyboard, Apple Pencil, remote control Apple TV 4 (Siri Remote) and AirPods. iPhone 8 and 8 more3.